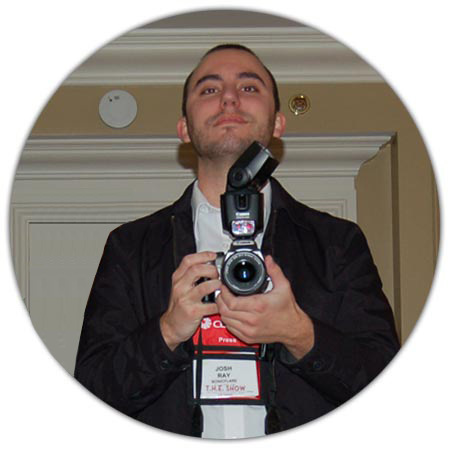 This was my first trip to CES/T.H.E. Show and it was also my first time in Las Vegas. Things that blink, wink, spit and spew all manner of noise, odor and color in a frantic and desperate grab for attention are The Strip. The bigger and louder the better because attention gained equals cash earned. Without getting too far off the audio course, what an absolutely brilliant idea to create an electrified oasis in the middle of a desert. And instead of providing water for the tired and weary traveler, you're offered sensually soulless overload. Vapid transit. 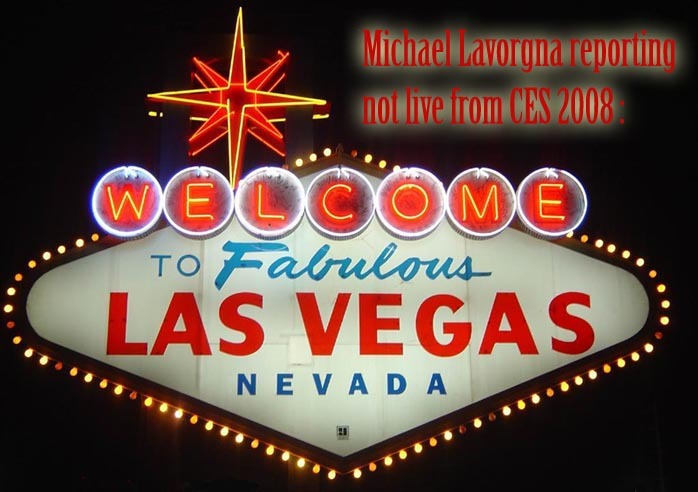 And I find it no small amount of irony that The Vegas Strip is recognized by the United States Department of Transportation as one of our official All-American Roads "for its archeological, cultural, historic, natural, recreational, and/or scenic qualities". Professionals, Multi-State Salinity Coalition, National Fellowship Of Raceway Ministries, American Urological Association, American Sheep Industry Association, Professional Bowlers Association and the World Of Concrete Exposition. To name but a few. What a wonderful event to be a part of. CES/T.H.E. 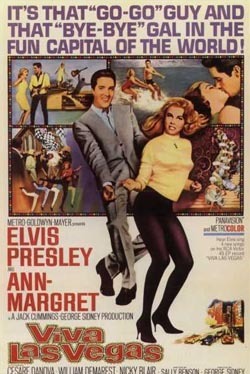 Show bringing music and its lovers to a genuine All-American Road. The Strip. Since I didn't see every room let alone listen to music in every room I was actually in, I'll refrain from any language that suggests a best or even most in terms of audiophile performance. Instead I'll offer a few thoughts on a few things that I particularly enjoyed. 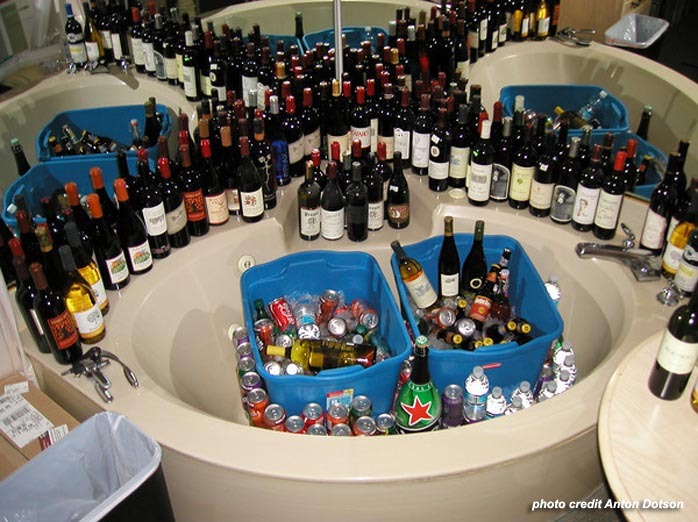 I only got to spend three days in Vegas and even if I had some sort of obsessive compulsive disorder to attempt to cover everything, I still would have come up short. A small army of professionals would need to be well coordinated to cover the sheer mass that is CES/T.H.E. Show. The official exhibitors list contained some 3,047 entries. Anton Dotson and Michael Alazard's room at T.H.E. Show is an open invitation for a good time. Nothing is for sale as Anton and Michael are not involved in the business of audio. 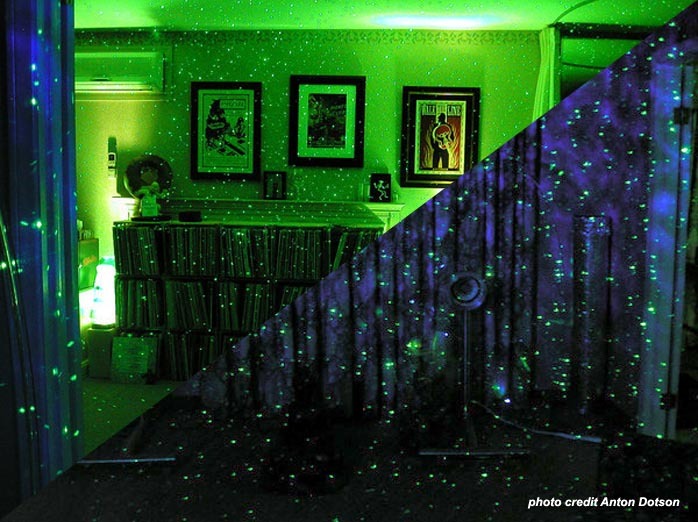 This is one room that's all good natured, kind-hearted, musically inspired fun. Among the best kind I'm aware of. Helping to jump-start the rollercoaster ride into relaxation, these gracious and generous hosts offer up a healthy (I believe they are both MDs) variety of imbibeables including a deadly home-made limoncello liquor. 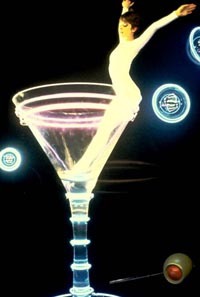 The excellent décor added to the sense of escapism and I felt as if adrift on a sea of soon to be forgotten memories. While I was in the EMT/Audio Stone room, I was able to listen in on a rare and to my way of thinking fascinating conversation between Micha Huber, the designer of the new Pythagoras turntable and Thales tonearm; Frank Schroeder of Schroeder tonearm fame and the designer of the forthcoming Artemis Labs turntable; and Mark Doehmann, the designer of the Continuum Audio Labs Caliburn turntable and Cobra tonearm. The conversation revolved around various aspects of tonearm design and implementation. While a fair amount of the details frankly flew over my head, it was utterly captivating to listen in on a conversation among three knowledgeable and passionate designers. Perhaps even more intriguing is the fact that while each designer has taken a different approach in dealing with the same set of physical problems, there was no animosity, ill will or even the slightest hint of anything but shared passion and mutual respect. And if you think about the fact that these people are truly accomplished professionals, i.e. they've actually built things that are sold and enjoyed as opposed to people who endlessly argue the merits of a particular implementation, I'd suggest the forum-dwelling keyboardists should take a cue and realize that not only is there no best way, it is a sign of maturity and real knowledge to accept difference, relish it and commit your time and energy to your passions while appreciating the same in others whether or not they agree with you. The new Pythagoras turntable (estimated retail price $80,000) from Audio Stone designed by Micha Huber is a precision-made piece of Swiss engineering. A belt-driven platter is powered by a synchronous motor which lies hidden beneath this table's clean, smooth surface. An optical sensor is integrated into the platter that monitors, calibrates and sets rotation speed while in 'calibration mode'. 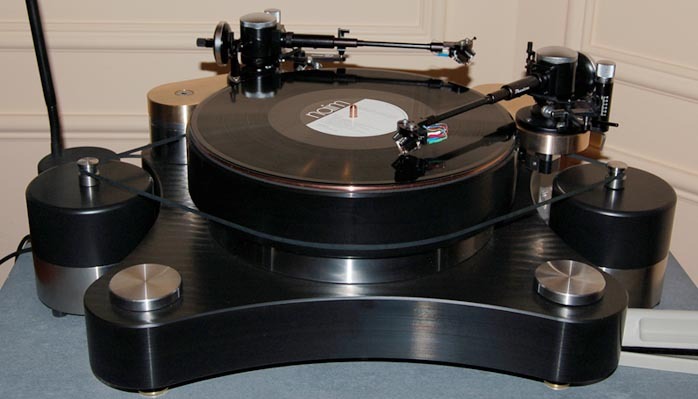 Once calibrated, the turntable goes into 'music mode' and maintains perfect pitch according to Audio Stone. The integrated rack is made from Norwegian granite and marine-grade stainless steel. Completing this package is the Thales tangential pivoted tonearm. 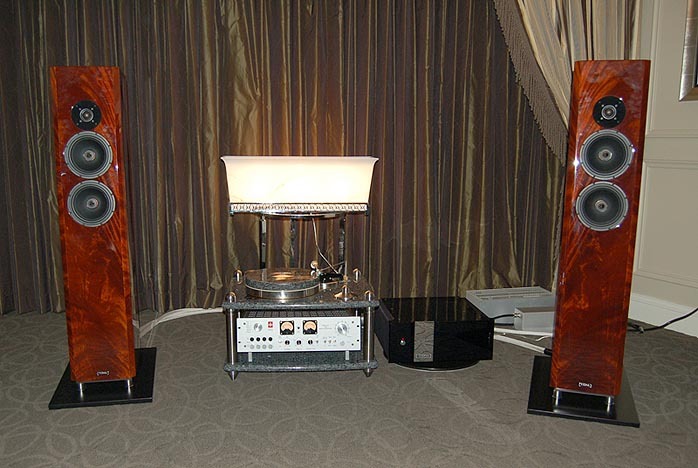 The Pythagoras 'table was paired with the EMT JSD-6 cartridge and the EMT JPA-66 Jubilee Series Varia-Curve Phono Stereo Control Center. The EMT products were used during the development of the Pythagoras table so there is the suggestion of a special synergy. We listened to a few tracks through the beautifully made Tidal Piano speakers and Tidal Impact power amplifier and the sound was indeed silky smooth. Jules Limon of EMT also treated us to a silent film which showed Helga, a thirty-year employee of EMT, constructing a cartridge by hand. This includes mounting the stylus into the cantilever and winding the coil on a custom-made jig with wire that's thinner than your hair to require the use of a precision microscope. Jules stressed how every microscopic detail is an essential ingredient that directly affects the sound of your music. These include the original formulae for the suspension system materials and its coatings from EMTs archives written on ageing yellowed paper and kept safely locked away. EMT has such a long and distinguished history, at times I think people overlook the fact that they have a complete line of cartridges for modern tonearms. I spent about 30 minutes in the Audio Note room and perhaps 5 of those minutes listening to music. The remainder of the time was spent listening (I'd be lying if I were to suggest this was a conversation) to Peter Qvortrup of Audio Note UK. Our lesson began with a comparison of two recordings on disk of Andres Segovia from 1928. The same track was transferred directly from the original 78 with no processing and a second time using a very simple and gently sloped filter to roll off some the HF hash from the original recording. Peter's question, albeit rhetorical which appears to be the case with him the majority of the time - which version was better? The obvious answer was a) the un-processed version since it clearly retained more of Segovia but also all of the scratch. The other version lopped off so much musical detail along with the noise one might be left with the impression that Segovia wasn't so hot a player. A bit of a fat-fingered fumbler. 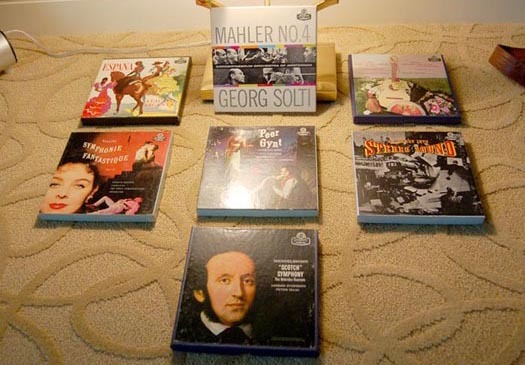 The issue at hand was the idea that in our pursuit of hi-fi cleanliness (my phrase and consider this a poor but hopefully semi-faithful paraphrasing with all the noise left in), we're erasing essential bits of our precious and fragile musical heritage. We're editing out irreplaceable nuance of musicians who will never be equaled. 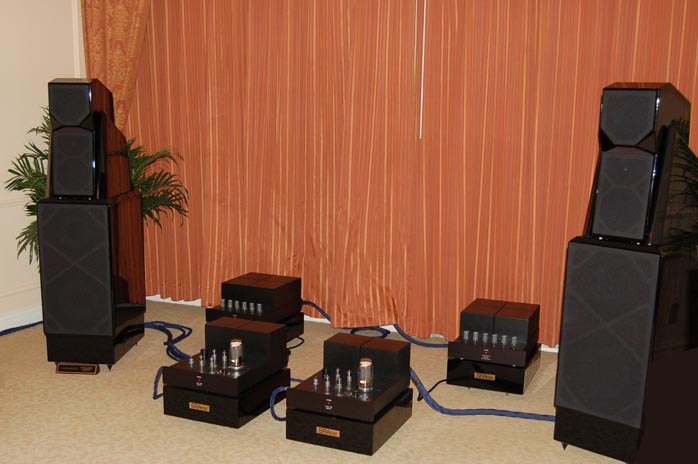 All in the name of a version that suits our evolving hifi sensibilities. The cart is killing the horse. "Your system is only as good as its ability to play your worst recording." While this may not be an exact quote, I think it captures an important aspect of an altogether captivating visit. The Lamm/Wilson/Zanden/TW-Acustic room remarkably (at least to me) was a wonderful, relaxed place to hear some great music. Jeff Catalano of High Water Sound was running this room and I was greeted with a host of original mono recordings playing on the 2-armed TW-Acustic Raven AC 3-motor turntable. I've heard Wilson speakers a few times and while it seems ridiculous to offer an opinion on 'em -- kinda like spitting into the ocean to make waves -- I thoroughly enjoyed my time with the Wilson Maxx2s this time. I actually went back first thing the next day to just sit and listen some more. I'd suggest, with complete respect to the various manufacturers, that Jeff Catalano had a lot do with this enjoyment. Jeff is now four for four in terms of rooms at audio shows that I completely enjoyed. And a big reason I believe this to be the case is his respect for and love of music (I'd recommend checking out Jeff's blog for his 'Playlists'). I'd even go as far as to suggest that this exact same room put into the hands of a high-resolution spinning amusical meister would have left me cold. But that's just me. 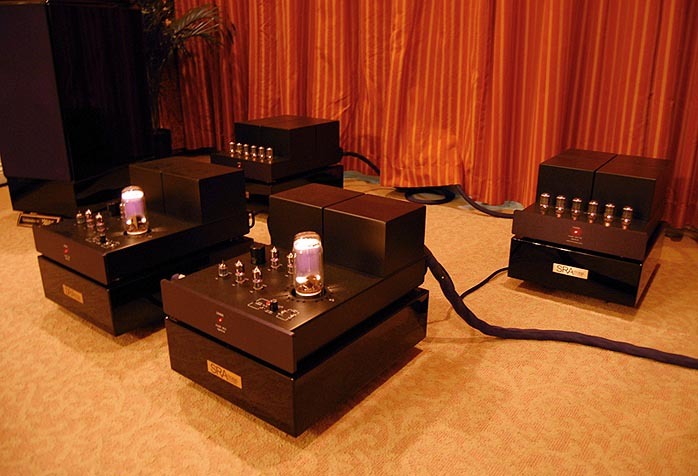 And while we're in a room with a $139,290 pair of 32-watt, GM-70 based single-ended directly heated triode Lamm ML3 Signature monoblock amplifiers (and I don't mean to be a wise guy but I would have rounded out that price one way or another), now may be as good a time as any to consider price. Since I will never own a system that costs upwards of a few hundred thousand dollars, I have no rational basis for determining value in this price league. That's because value is in part determined by affordability. And affordable is not a fixed number. Whether we like it or not, there are people who buy gear that costs this much and more. I have no issue with this fact whatsoever and I have no issue with the fact that that person will never be me. In terms of value, if someone was considering buying the Wavac SH-833s and then heard the new Lamm ML3 Signature monoblocks and thought "whoa, these things are even better", they just saved themselves about $200,000. That's value if I've ever seen it. Or to think of it another way, let's say your system cost $9,750 and that amount represents 15% of your annual income of $65,000. 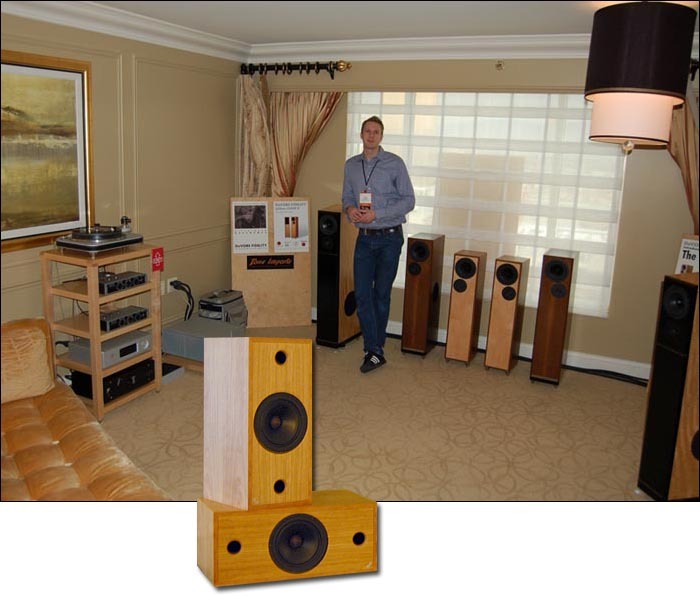 Now let's imagine some guy who just bought the complete Lamm/Wilson system in the Venetian Suite 34-309. The whole damn thing from soup to Kubala-Sonsa. And this price represents 3% of his annual income. You, my friend, have just been less thrifty than Joe Lotsabucks. Relative value and net worth are harsh and sobering bedfellows. Of course none of this has anything to do with musical enjoyment which has nothing to do with how much money you have or spend on your gear. A dual-mono tube-based phono preamp with adjustable EQ curves for the proper playback of early mono and 78RPM recordings? Does it have a USB input and iPod dock? 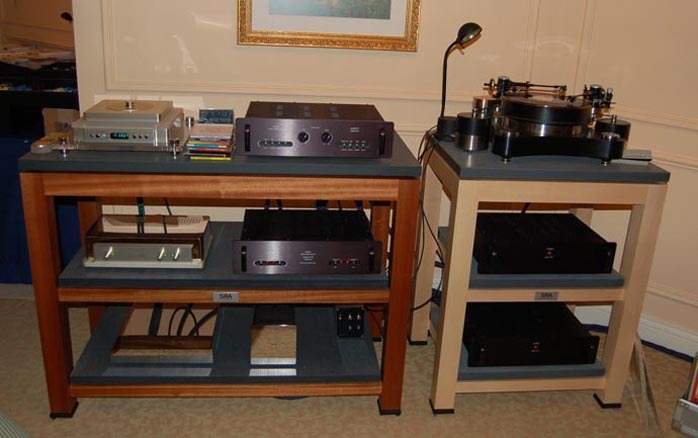 DeVore Fidelity showed with Ayre Acoustics (V-1x amp, K-1xe preamplifier and C-5xe universal stereo player), EMT (the beautiful 997 tonearm, OFD25i mono and TSD15Lzi stereo cartridges), Sentec, Cardas, the Spiral Groove turntable and a quietly lovely rack from a new company called Box. 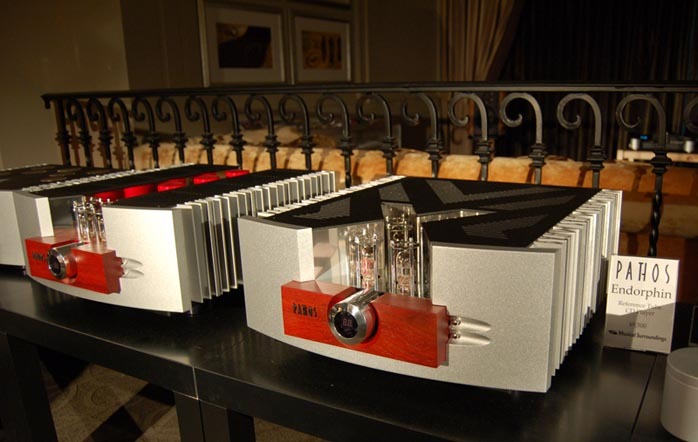 The entire DeVore line showed up in Vegas including a pre-production pair of gibbon 5.1 (target price is $1,000/each - think center channel) which incorporates a DeVore-designed coax driver. The coax design allows for horizontal or vertical speaker placement with no phase anomalies. Since I'm friends with John DeVore and Jonathan Halpern of Tone Imports, I'll refrain from comparative comments pertaining to system quality and instead simply continue with the theme of musical preservation. 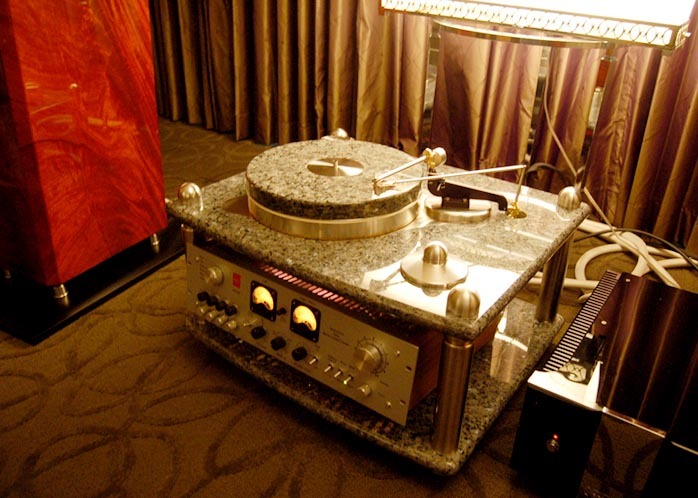 For those who follow this stuff, DeVore Fidelity and Tone Imports played mainly 78s at the last CES and this year listeners were served up a host of mono recordings properly EQ'd by the pair of Sentec EQ10s. This was also one of a few rooms where a request for "female vocal" could mean you'd get P.J. Harvey, Cat Power, Ella Fitzgerald, Juanna Molina, Sarah Vaughan, Kate Bush, Mimi Parker (Low), Netania Davrath, Nancy Wilson or as John DeVore might say, ABJ - "Anything But Jacintha". And all of these choices were on vinyl. The CD list is longer but somehow seems less important since they're so much smaller and easier to pack. I also overlapped with our own Jeff Day for a few frenzied minutes of stimulating conversation in the DeVore room. It was great to finally meet Jeff face to face. In some ways, the DeVore room turned out to be meeting central as I also ran into Sonic Flare's ever enthusiastic Josh Ray [below], an effervescent and perpetually camera-clicking Danny Kaey, and Wes Philips who told some wonderful stories with a casual ease and relaxed pace I found uncommon but welcome in the show's otherwise frenetic environment. recording from Verity's Montreux vaults. Don Better is a professional musician, professor of the guitar, former record label owner, audio dealer and all-around nice guy. And Don's father was the first audio dealer in Cincinnati. So when Don listens to Jeff Beck on a hifi, Don's listening is informed in many ways that mine isn't. That said, I'll say this was among the best Jeff Beck performances I've ever heard (oops, I slipped in a best after all). I'll also say the Nagra gear is among the most tactilaceously appealing I've seen and it's nearly impossible not to touch. The Swiss certainly have a way with moving parts precisely. The new Verity Sarastro speakers were having no problem filling this extra large suite in the Mirage driven by the pointed Nagra Pyramid monoblocks. and the Basis Audio Debut Diamond Signature Turntable with an EMT JSD-6 cartridge into the new Nagra VPS (Valve Phono Stage), there was no doubt to my ears that as beautifully made as the Nagra digital combo was, it got smoked. 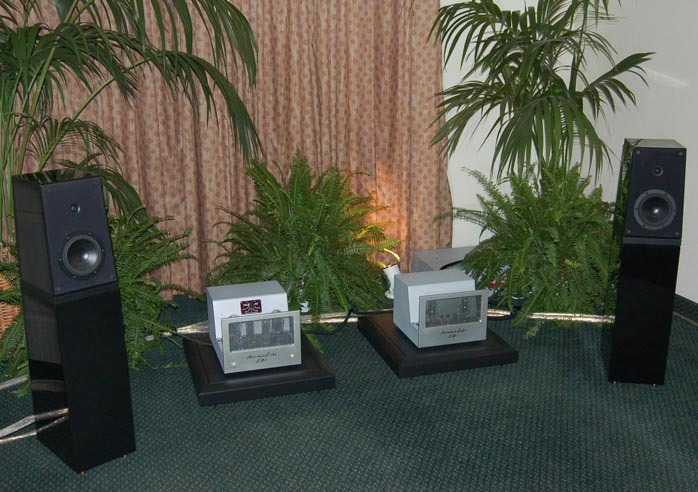 The Artemis Labs room also featured Verity speakers paired with the Artemis SP-1 Power Amplifier and LA-1/PH-1 line/phono stages. 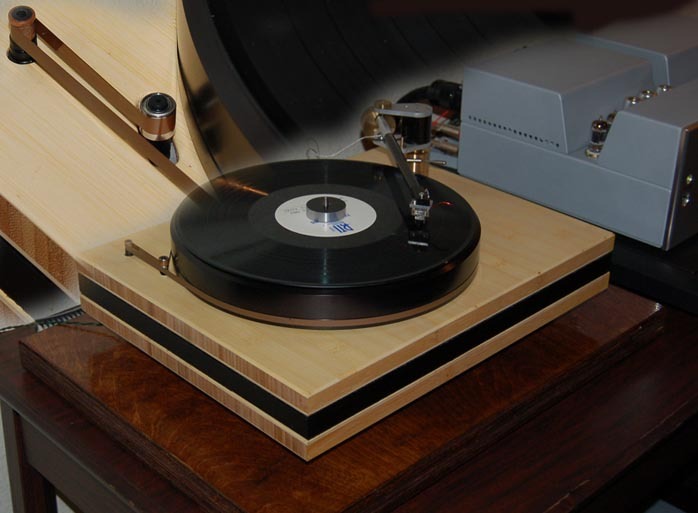 This system sounded wonderful, relaxed and pitch perfect while playing some great tunes on the prototype Frank Schroeder-designed Artemis turntable using the Schroeder Reference SQ tonearm and the Voice cartridge from Soundsmith. 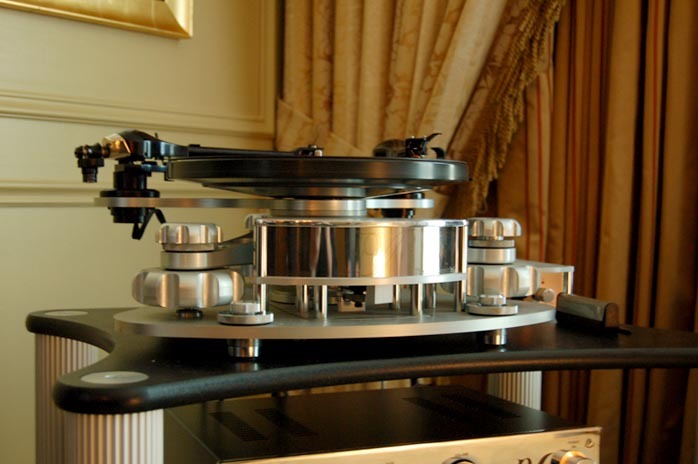 The as yet to be named turntable (estimated retail price $6,000) incorporates a clever twist for its tape drive. Here's a description from John DeVore that I stole from an email conversation (with his permission of course): "Frank's 'table used a tape drive, but not the primitive drive where the separate motor is placed by hand to get approximately the correct tension on the tape (remember the tape is not elastic, so the tension is extremely critical). His tape drive incorporated a tension arm/roller like a reel-to-reel deck in order to always have exactly the right tension. He also cleverly positioned the tension arm so the tape is in contact with more of the platter, thus increasing the torque transfer. Also, I would imagine that the tensioner would help to smooth out some of the motor cogging, and compensate for eventual tape stretching. Very very elegant. The motor also ran against an eddie-current brake (à la Garrard 301/401), keeping it perfectly loaded for smoothest operation." As a matter of fact, 'clever' is a word that can be used to describe many aspects of Frank Schroeder. 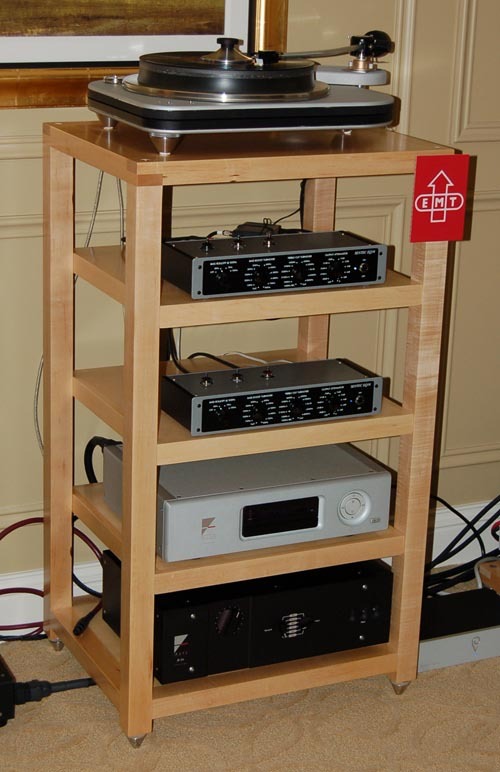 I found this quote from Frank in Ed Barker's review of the Schroeder DSP tonearm and thought it conveyed a sense of what I consider to be a preeminently reasonable attitude worth repeating: "If this review managed to whet your appetite, then go out and find a dealer or representative, attend a show where one of my arms is used in a demo or, best of all, try one at home. At least you'll know what the reviewer is talking about. And even if you decide to spend your money elsewhere, I won't be disappointed since that'll give me more time to go and fly a kite with my son..."
Dan Meinwald of E.A.R. USA was spinning some wonderful music on CD, vinyl and tape (like Duke Ellington's Indigos). The new Form Series loudspeaker from Marten Design called 'The Floor' (€4,500/pr) were both slick looking and sweet sounding. Coupled with the gleaming E.A.R. 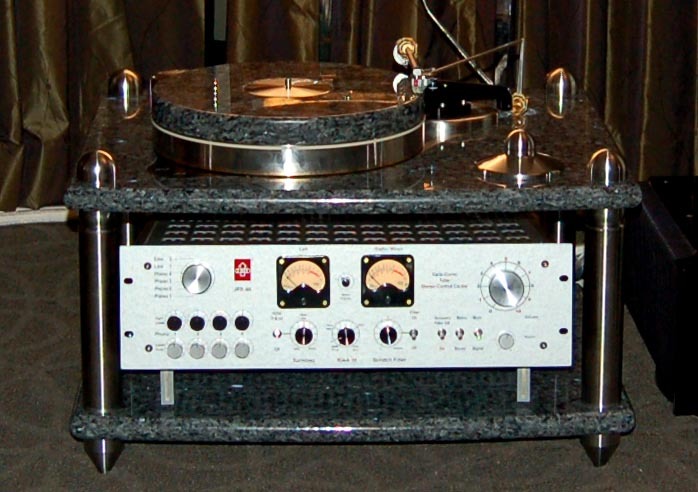 890 amp, 868 Preamp, Acute CD player and Disc Master turntable, this was one flash rig. 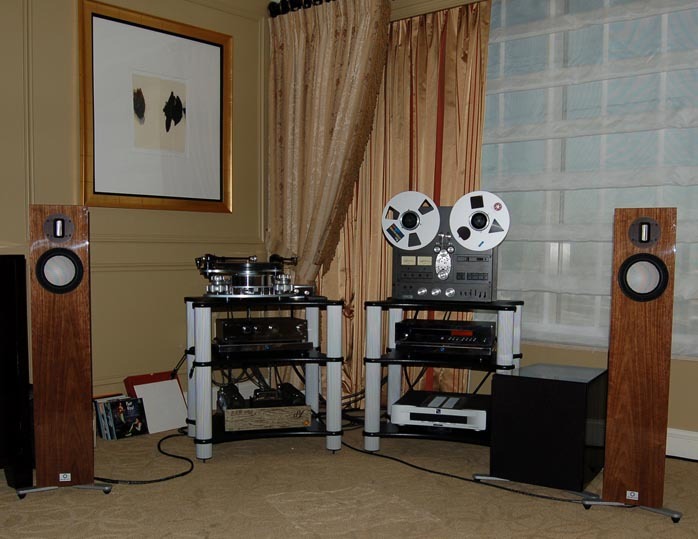 Also in use was a Tim de Paravicini-modified Technics RS-1500 reel-to-reel deck. 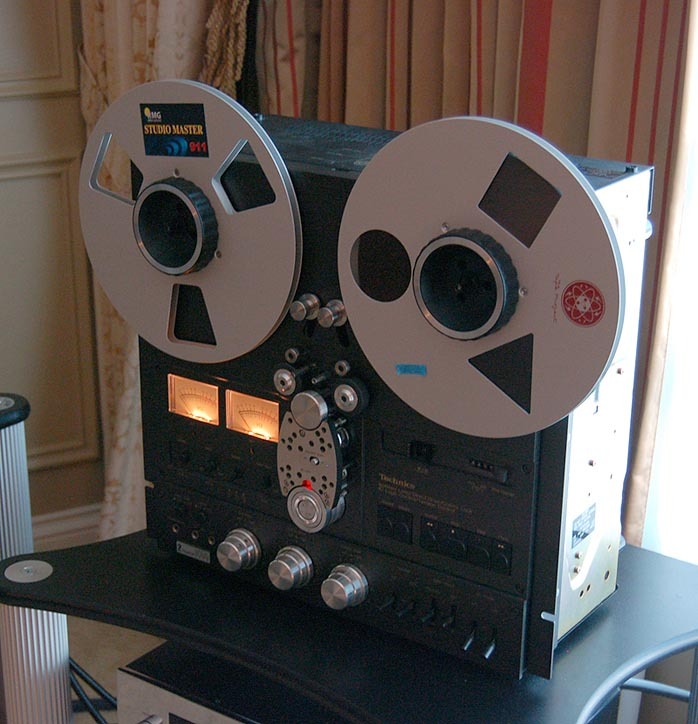 There were actually a number of open reel decks to be spotted throughout the show and part of the excitement is related to the very very cool Tape Project. The Tape Project offers brand spankin' new 15ips ¼" half track copies made from the original analog masters. While not inexpensive at $200 each, these "1.5 generation" master tape dubs sure sound wonderful and can cost less than their equivalent cherished LP first pressings. The E.A.R. room was also the one and only place I heard Ol' Blue Eyes and I almost misted up. I would have clapped at the end of the track but I didn't want to disturb E.A.R. designer Tim de Paravicini who was catching some well deserved rest after mercilessly beating on his beautiful Disc Master turntable with a metal cigarette lighter to illustrate its sound isolation properties. The Pathos room screamed Italian design which may lack subtlety but certainly exhibits no issues of uptight restraint. 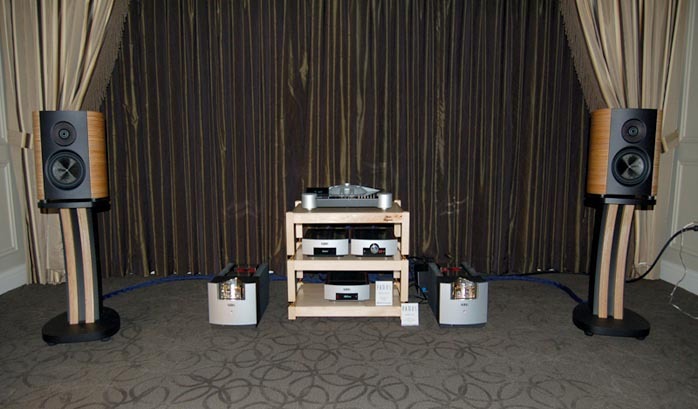 A pair of InPower monoblocks, InPower preamp and Endorphin CD player drove the $26,000 stand-mount Magico Mini 2 monitors. I believe their stands are included in that price.